To be a successful creative team, the players must work and evolve together. But it cannot only be about the collective. Each individual must concurrently seek personal expression and growth, in concert with their contribution to the group’s activities. Kate Jordan and Bruno Augusto, who together make up Arts & Above, have constructed a program that allows the audience to glimpse into both sides of the artistic process: solo work and partnership. Experience 2.0 begins with a set of performance art solos in which each artist makes their own statement: Augusto in AngolanAmerican and Jordan in Build. Closing the evening is CoHere, a contemporary dance duet where, as the title suggests, two parts of the same whole cling together. process. Some kind of vehicle was traveling down roadways, pathways and highways and we were watching the route from its perspective. Instantly, the notion of a journey was present in the room, even before AngolanAmerican formally begun. 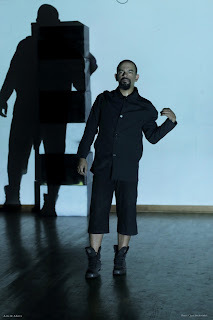 Augusto slowly moved onto the stage and a dual presence emerged – he was physically in the space and his projected shadow also became part of the video installation. Unfortunately, I was only able to see the last third of this solo, once the moving videography had stopped. This was not a fault of the piece. It’s just that this type of video causes motion sickness for me, so I could only look at the action onstage for a few seconds at a time before needing to look away. But even in those short viewing spans, the depth of AngolanAmerican still came through. What I could see was a profoundly personal journey. One section found Augusto constantly changing hats, putting on different ones and in different orders. This felt like a comment on revolving circumstances as well as indicating the non-linear nature of most journeys. And the juxtaposition of the shadow and the real person captivated; revealing our disconnected-ness with reality and perception. some frustration was apparent in the piece, generally speaking, the crates didn’t look like obstacles. Instead, they were just objects that were a part of a larger process. The possibilities in Build far outweighed the constraints, and the final structure was an impressively tall tower, requiring attention, diligence, confidence and palpable intensity. A short, intimate duet, Jordan and Augusto joined forces for the final work of the evening, CoHere. By far, the danc-iest piece on the Experience 2.0 program. Narratively, CoHere tackled care and dignity, though certainly in a deconstructed manner of speaking. And structurally, the work examined unity. To both of these ends, the choreography found the pair clinging to one another for support, for protection and for comfort. This was present in walking motifs as well as in catching and releasing sequences. But at the same time, there were also moments where the desire to break away and exert one’s own authority was at play. This was particularly apparent in one dynamic repeated phrase. With increasing speed and force, each dancer continually ran, fell and rolled away from the other.